Hello, Merry Christmas and welcome to the Christmas Traditions Ornament Crochet -A-Long here on my blog! If you are just joining us for this CAL or would like to get all the info on our Christmas Traditions Ornaments – please click HERE to read through the introductory post! Without further ado, let’s get to our ornament! THE TRADITION: O Christmas Tree! This one is pretty straightforward – put up your Christmas tree! I’ll be practicing this tradition with my family on the first of December, as we always do. Go pick out a fresh tree, or haul your artificial one out of the attic, and put her up for all the family to see. We don’t decorate the tree the same day as we pick it out and get it up in the stand. Usually, to be honest, that is enough work for one day and we spend some time the following day decorating our tree (hint: watch out later this week for that tradition ornament!). So this ornament’s tradition is to simply put up the tree! As with this entire project, I’ll be using Lion Brand’s amazing 24/7 Cotton – check out the kit for this project HERE! **For the body of the tree, don’t join your rounds. Place a stitch marker on the first stitch of each round so that you know when to continue on to the next round. With yellow, make a magic ring, *Ch 2, sl st in the 2nd Ch from hook, sl st into the magic ring, repeat from * 4 more times (total of 5 points to your star), tighten your magic ring, and finish off leaving a long tail for sewing. 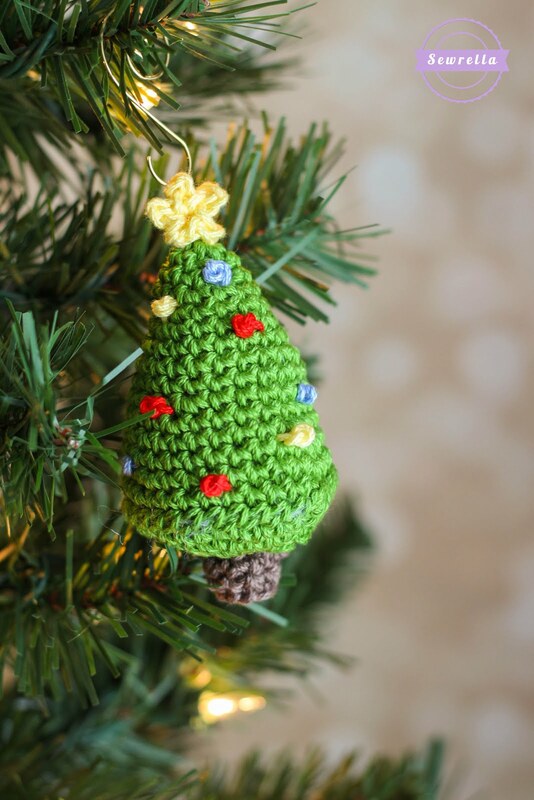 -Sew bottom of the tree onto body of the tree – I used a whip stitch and my tapestry needle for this, not a slip stitch or single crochet as you’ll see in some amigurumi joining! I used some ornament hooks from Amazon to hang this little cutie on my tree and he looks just darling! Put this one on your tree just as soon as it’s up at home!